Marshmallows in your hot chocolate? Rum in the egg nog? For the full experience of holiday magic ... try Christmas in Connecticut. During the holidays, the state becomes a snow-covered fantasy land of light, music and family attractions throughout the season, beginning with the capital at Hartford lit up like a Christmas tree. 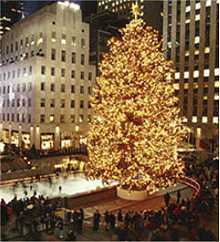 • The tallest Christmas tree ever to adorn Rockefeller Christmas was a 100-foot Norway spruce from Killingworth, CT in 1999. • "Christmas in Connecticut" is a holiday classic, but the cast and crew never once set foot inside the state. The screwball comedy (starring Barbara Stanwyck) was shot entirely in Hollywood at Warner Brothers Studios during the summer of 1944. • Local legend has it that the very first indoor Christmas tree in America was in Windsor Locks, CT, set up by a Hessian soldier who was captured during the Revolutionary War in 1777. • Today, Connecticut boasts the most Christmas tree farms in New England with 490. • The odds of a white Christmas in Connecticut? Historically, there's a 90% chance of a white Christmas in some areas of northern Connecticut, plummeting to about 20% the closer you get to the shoreline. Hartford Holiday Light Fantasia - The 2-mile show transforms Goodwin Park into a drive-through wonderland with a beautiful collection of over 1 million lights. Christmas at Mystic Seaport - Information on the complete calendar of holiday events including the annual Lantern Light Tours, community carol sing, and the year-end Holiday Magic show under the Planetarium dome. Fantasy of Lights at Lighthouse Point Park - The annual spectacular on New Haven harbor allowing visitors to drive through an enchanting land of more than 200,000 lights. Welcome to Bethlehem CT, The Christmas Town - The place to be for holiday fun with information on the annual Christmas Town Festival with photos, maps and directions. Essex Stream Train - North Pole Express - All aboard this special nighttime excursion for a visit with Santa, story readings, sing alongs, hot chocolate and more, beginning in late November and continuing throughout the holidays. Make your reservations online. Florence Griswold Museum Holiday Events - The stately mansion in Old Lyme with information on their annual Christmas program including Christmas craft projects, horse drawn rides with Santa, and Teddy Bear Tea Parties for toddlers. Where to Get Christmas Trees in Connecticut - Click on the interactive map to find retail and cut-you-own Christmas tree farms by county or town, with contact details and related links.